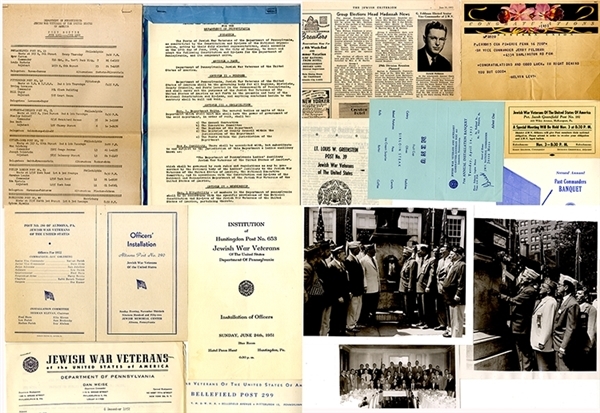 The archive opens with (1) “Constitution and By Laws JEWISH WAR VETERANS of the United States of America for the Department of Pennsylvania”, 10 pp., with tissue copy. (2) then, “1951-52 Department of Pennsylvania Jewish War Veterans ... Post Rooster” listing the 42 chapters and commanders. (3) Three B/W photos of the members of the organization. (4) Six various related pieces of ephemra, menues, banquets, Officers Installation, ect. (5) +/- 50 Typed Letters mostly on Jewish War Veterans letterhead, 1952, all VG.